Warning: This post is not pretty. In fact, far from being pretty it is full of images that are shocking, ghastly and not for the faint hearted. That’s because beauty is not always pretty. Often it can be shocking, ghastly and not for the faint hearted. And that’s what Lush is trying to hammer into our collective consciousness through it’s Fighting Animal Testing campaign that’s currently running across the world. 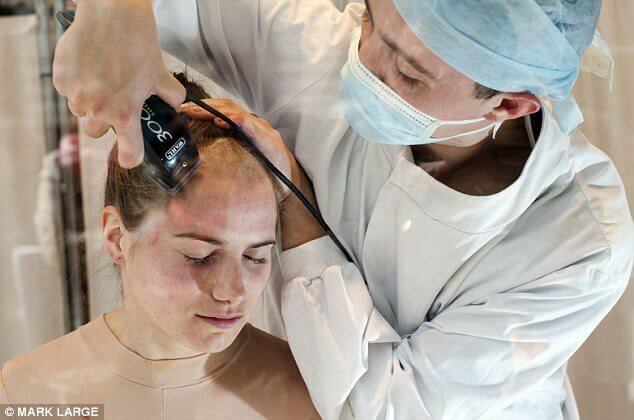 Yesterday, in London, the ‘cruelty-free’ beauty brand made their point by putting a 24-year-old girl in a store window and subjecting her to force-feeding, injections, pouring of chemicals in the eyes and a myriad other gruesome acts that animals go through in the name of cosmetic testing. There are so many aspects to this debate that it would need a hefty book to present them all. We all have our personal opinions. Do I think animal testing for beauty products should be banned? Absolutely! Will I boycott brands that test on animals? To be honest, I can’t afford to do that if I want to have a job. And then the trump card of the pro-animal testers: What about medicine? Would I make a hue and cry about animal testing in medicine? No, I wouldn’t, as long as it’s the only possible alternative in the creation of a life-saving drug. And, frankly, much as I love my cosmetics, they are not exactly necessary for saving a life. And surely, there is always an alternative way to figure out their potency and side effects other than subjecting mice and rabbits to gruesome experiments. If my face mask means that a rabbit has to die a tortuous death then no thank you, I would rather just live with a dull complexion. So, I support the Lush campaign 100% and love that they are hammering home the message sans any sugar coating. This is what we need to see – a visual reference that jolts us awake. In India, we don’t have live displays of humans being tortured in Lush’s display windows (should I say thankfully?) but what you can do is go down to the nearest store and sign a petition that will be forwarded to the President of the country, in order to ban animal testing in cosmetics here. 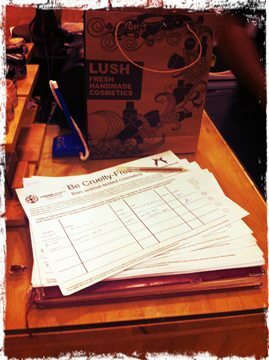 Similarly, every single Lush store in every country has a petition – it takes just a minute to fill out, you are not required to buy anything and it will make a world of a difference to our furry friends. SO DO IT TODAY!